Last Friday and Saturday we experienced much rainfall in this region. So, I was grounded during that time unable to lift skyward and journey out. Sunday after Church, though, the weather completely cleared up and was superb. Kansas in the Spring is a constantly changing weather environment. For instance, the day before I wrote this story it was a “short sleeve T-Shirt” 68 degrees at 8 am. By the late afternoon the wind had come around to the North and brought the temperature down to the 30’s that evening. Sometimes the temperature will change dramatically in minutes. This volatility makes Kansas part of Tornado Alley. Anyway, Sunday my moment had arrived. The yard work was done. I had no deadlines to complete for my business (The Sky Surfer has to work to support this flying habit). I grabbed my Flying Gear and headed to Selby Aerodrome to do some aviating. For a change I had decided there was no need to document the flight for posterity. 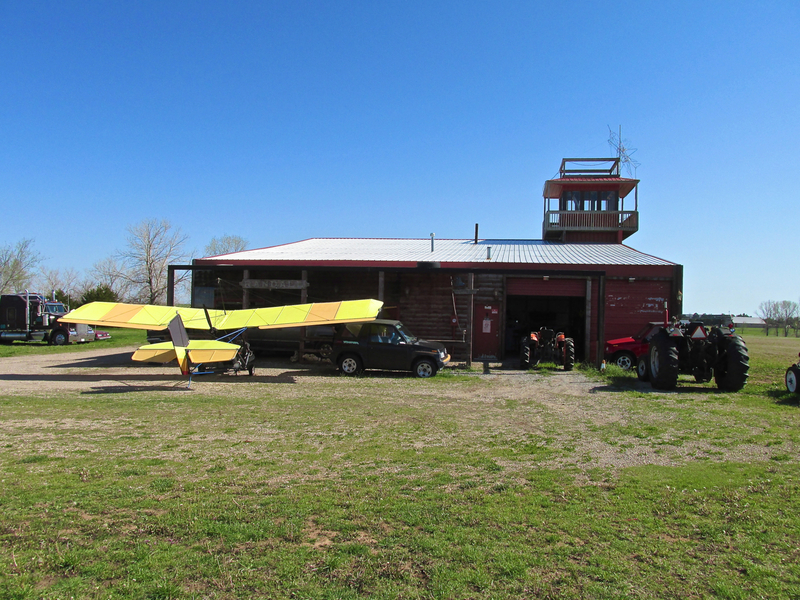 The previous week I had put considerable effort into writing down everything I saw, thought or heard or was told on my flight to Perry, Oklahoma. This Sunday Flight was to be “casual”. Little did I know this was not to be. Sometimes when making a casual, “no destination” flight, I just take off and “ease South”. McConnell Air Force Base is North Northeast of our field and Mid Continent Airport is North Northwest of it. So, with two controlled airspaces to the North my initial direction of flight is always from 90 to 270 degrees. For me, the raison d’être for Sport Flying is to get into the air – destinations are icing on the cake. Often I just cruise the area for an hour or so and then come back to the field and land. Other times my Fun Flying will include landing at one or more of the uncontrolled airfields around the “neighborhood”. Wellington Municipal, Cook Field, Cherokee Strip, Butler Airpark and Alley Field are part of that zone. Cherokee Strip and Alley Field are the most fun places to stop because I know guys at these fields. If they are around I can see what they have been doing lately. Last Sunday I decided to fly “The Southern Triangle“. I opened the flight into the South wind that had brought the good weather into town. This would eventually take me to Cherokee Strip. Then I would head downwind to Alley Field and then crosswind back to Selby Aerodrome. Simple. The temperature was about 75 and the wind was 18 with gusts to 25 – at least that’s how it was reported on the North side of Wichita that day. My GPS showed the wind to be a little higher down South but it was no big deal. Regardless, as you can see above, after arriving I parked my MXL on the North side of Tommy’s business (Ranco Custom Products) to stay in the “wind shadow”. I did this because there are no tie downs there and I didn’t want my plane to “walk away” while I was inside. Tommy has a railing at the front of his business. It reminds me of the ones Cowboys used to tie their horses to in The Old West before stepping into a saloon. Tommy is a busy guy. About 75% of the time I drop into Cherokee Strip he is not there. Today was part of the other 25 percent. 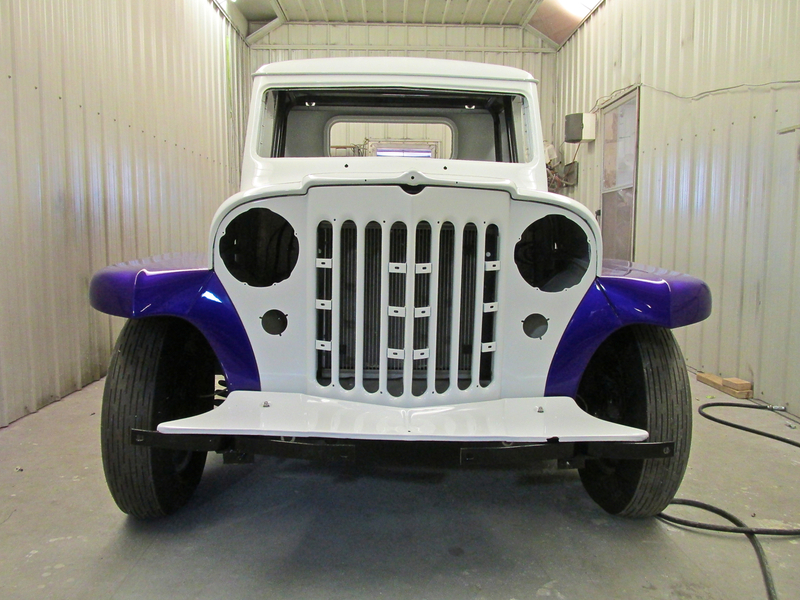 The Willys is owned by Dennis Barr of Wichita. Everybody has to get in the act. 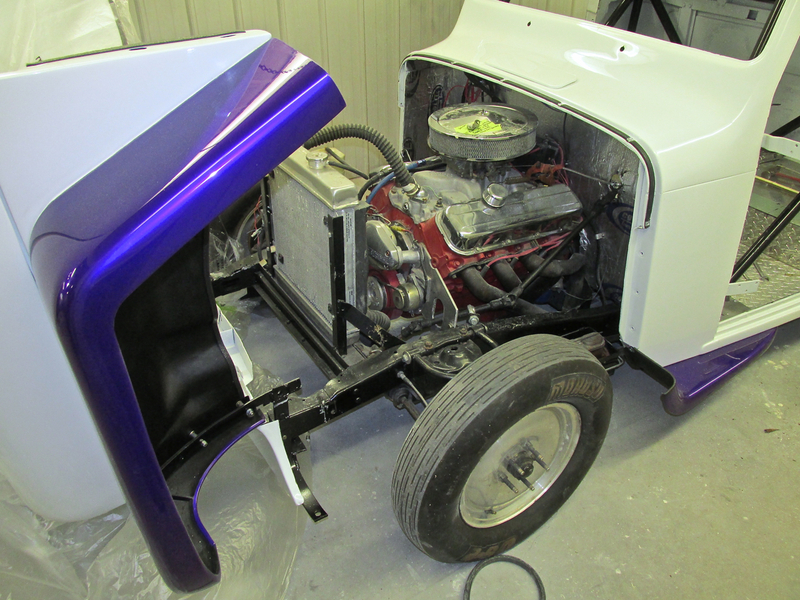 The engine is a Chevy 454 bored to 468 cubic inches. The paint is a Four Stage Candy. 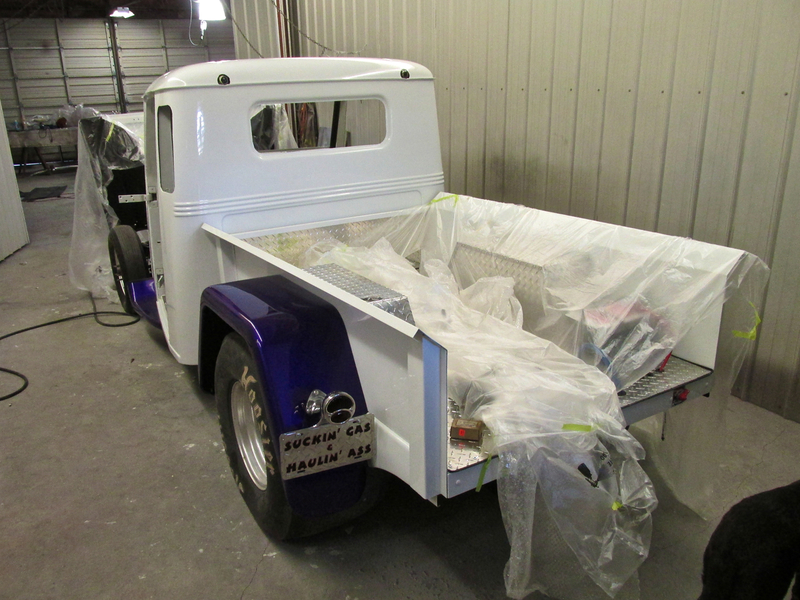 As you can see, pretty much every part of the old Willys has been re-designed by Dennis. Note the Hoosier tires. 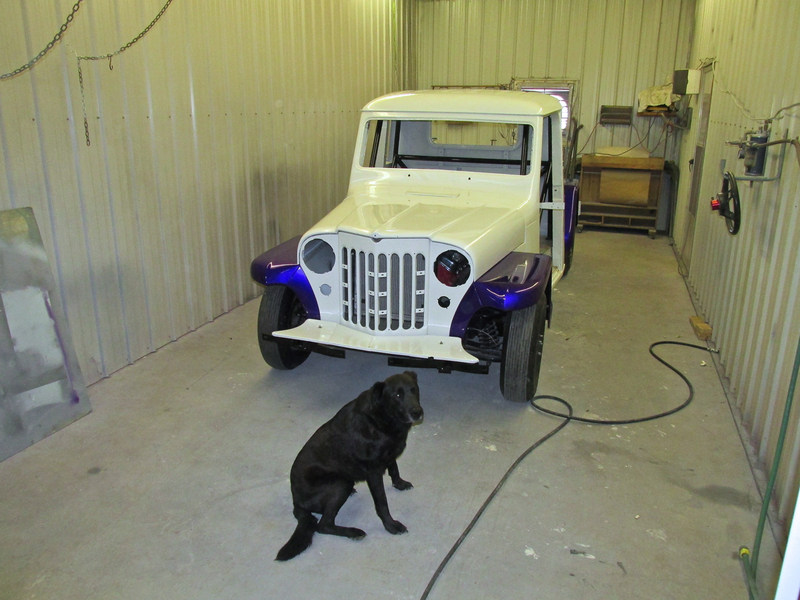 When it is finished Dennis will be giving it to his daughter Courtnie to race at the drags. Nice Present! 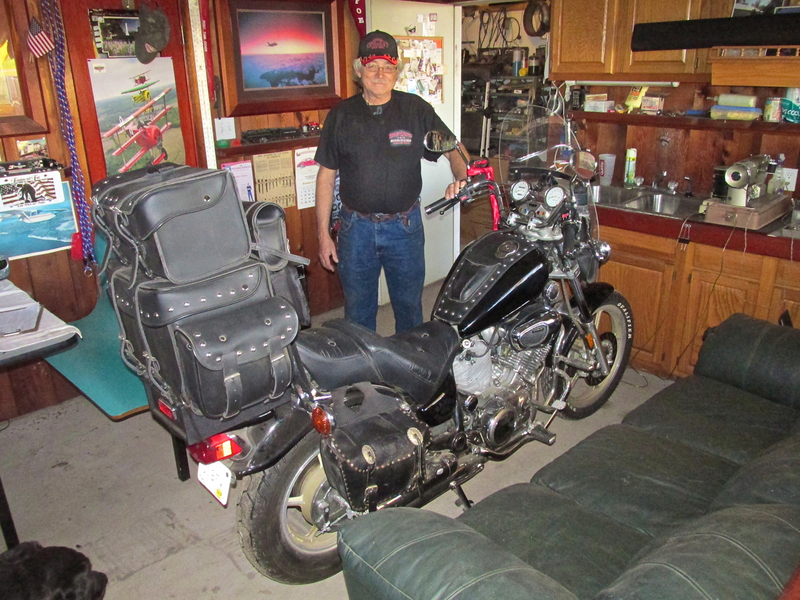 As we headed out so I could work on my “project”, Tommy stopped to show me another one of his projects – a Harley re-build. A Harley Davidson Golf Kart, that is. I didn’t know there was such a thing. Maybe I need to take up golf so I can drive one of these around a golf course. 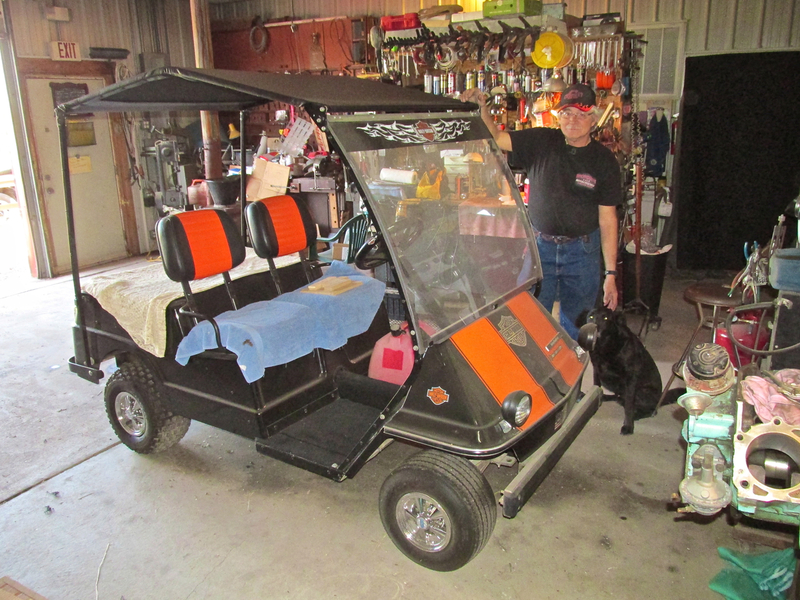 A Harley Davidson Golf Cart. Perfect for tooling around the runway and into town. He also just finished putting the final touches on his Virago’s luggage. He has a place for everything now. Anyone who has earned their Private Pilot Rating or any ensuing aviation tickets knows that shortcuts are to be avoided. Flight Instructors harp on this constantly. “The day you don’t check for water in the fuel will be the day your engine cuts out on takeoff – with trees ahead.” or “The day you don’t do a proper pre-flight will be the day you take off with the control lock still on your elevator.” or ” The day you don’t pull carb heat while descending will be the day ice covers your carburator, your engine quits, and you dead stick into the middle of town.” etc. etc… I could go on but you get the point. We have all been warned about taking shortcuts. There Is No Excuse. Well, I confess, I took a shortcut and had to pay the price. The results of this completely avoidable lapse in judgment (gross laziness?) are contained in the photos below. The Sky Surfer was humbled and brought low. Escaping with my life in spite of committing the monumental error of “corner cutting”, I felt duty bound to the Flying Community (and others who contemplate taking up the noble calling of Aviation) to share my regrettable incident in the hope that they might save themselves this ignominy. 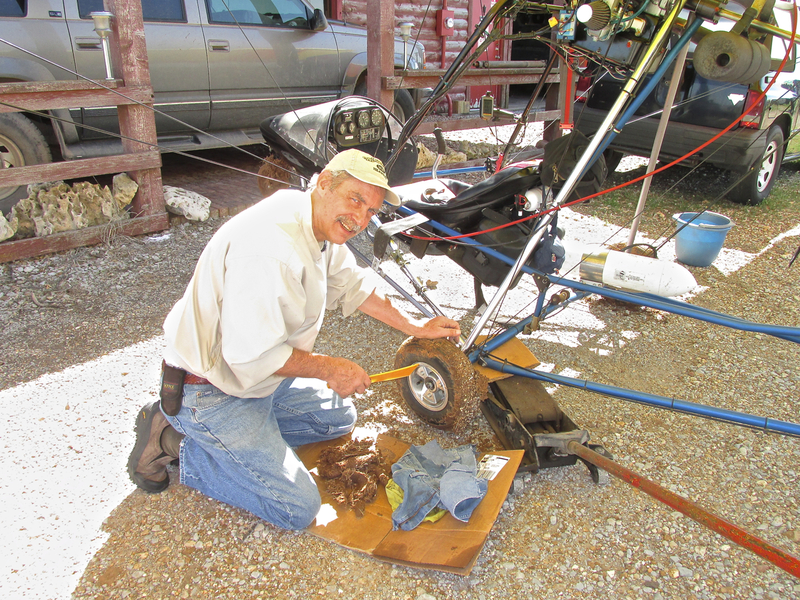 It all started just after landing at Cherokee Strip. The “shortcut” off the active to Tommy’s Place. 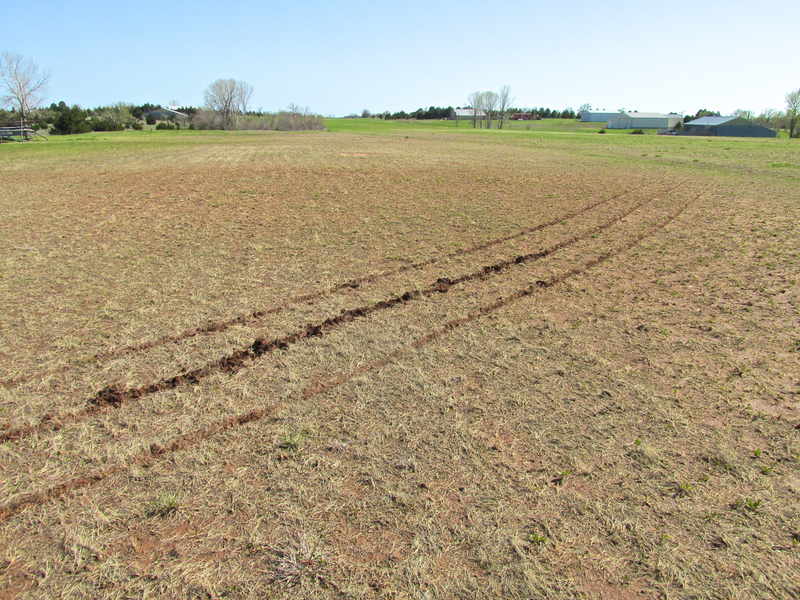 This nice, flat field looked innocent when treated to a casual glance… The ruts left after “the incident” appear insignificant. At first as I took the shortcut to Tommy’s front door it didn’t “click” why the Quicksilver had suddenly ground to a halt. My first impulse was that the slightly rising grade had slowed my momentum. I did the first thing that comes to mind “Give it more power!”. That sort of worked. I started inching forward but felt a strange “loping” movement like a turtle wobbling from side to side when it pulls itself across the ground. That’s when I finally looked down and back at my main wheels. Bummer. Picture taken after finally emerging from “the field of sorrow”. Both main wheels were like this. Finally my lightning fast mind realized the predicament into which I had put myself. By then it was too late to turn out of the mud pit and, not being a C-17 Globemaster, I couldn’t back up. 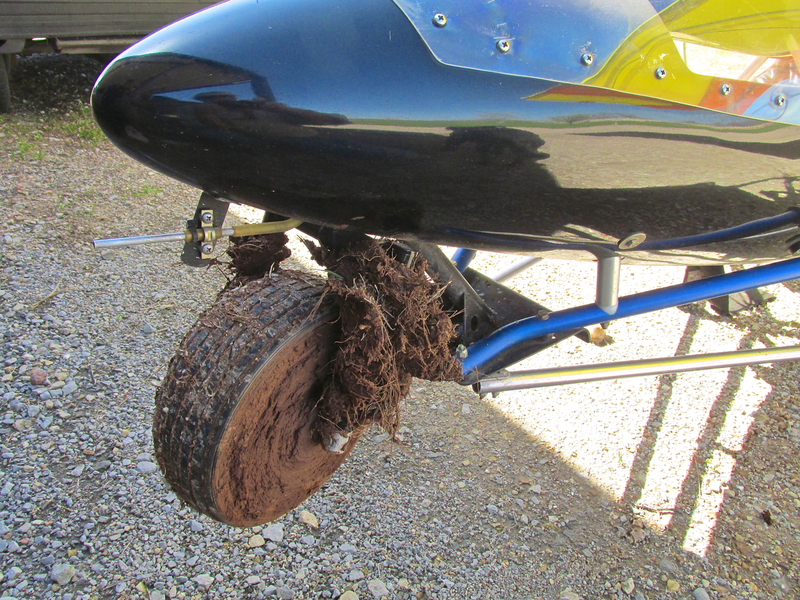 My perceived options were to “power through it” or get out and push the MXL out of the mud. From the picture above you will see why I had no interest in putting my shoes in that. About then Tommy appeared on the edge of the morass grinning and gently shaking his head. He wasn’t walking out in that stuff either. Even though the “power method” eventually worked to get me out of the mud, it took about two minutes to travel 10 yards. I was very worried that if I got going too fast I would throw one or more of those rocks into my PowerFin Prop and ruin it. As an additional benefit, this slow, deliberate pace served to “hard-pack” more layers around the tires. 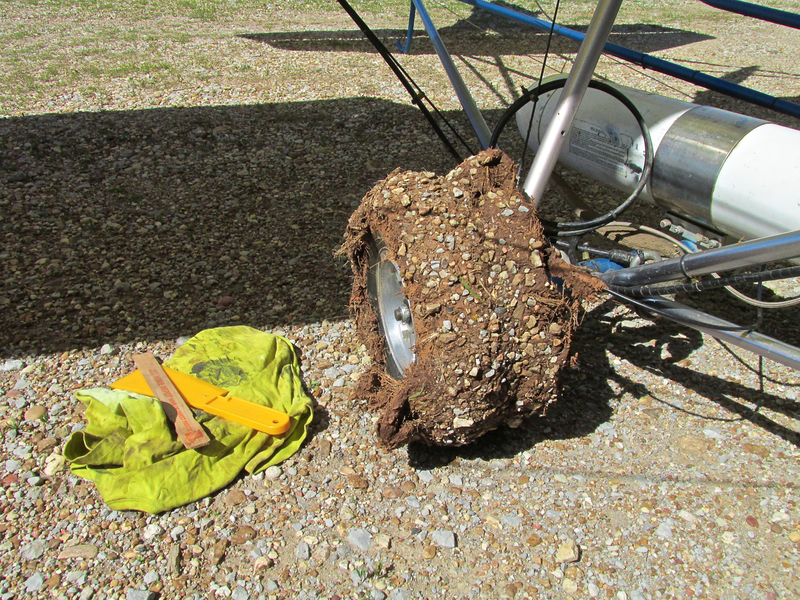 There are actually spokes under all that mud. Tommy Randall documents the disaster and also provides the relief. 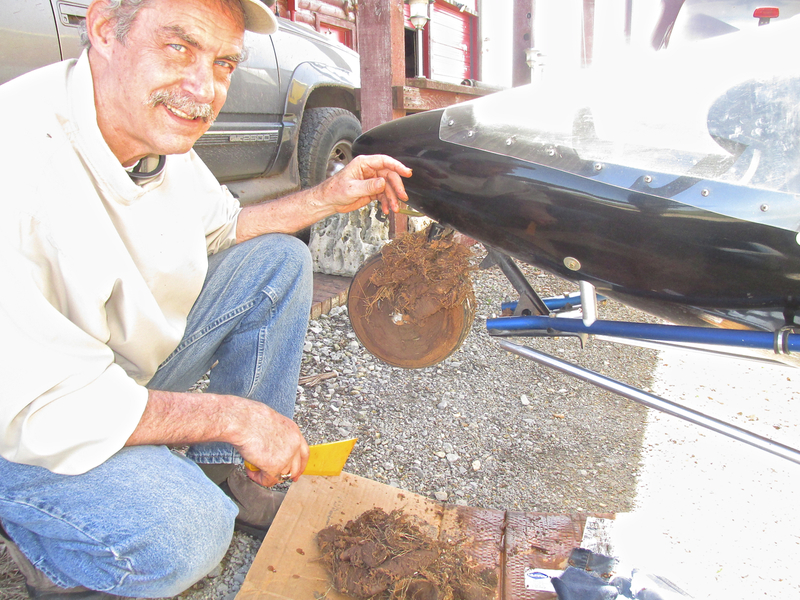 I was extremely fortunate that Tommy was in the shop that day because it would have been MUCH harder getting this stuff off the tires with my bare hands. Tom brought me out a scraper and a jack and water and rags. All he asked was that I replace the divots on his driving range. Even with that, it still took about an hour to remove it. Aviation Is Not A Place To Cut Corners! After lightening the load from my airframe I bid Tommy and Dennis adieu was able to steer clear of mud puddles the remainder of the day. I know they say confession is good for the Soul, but I don’t know that I would have the determination to confess something as impressive as this! Good Show! Now that I have The Flight Blog it seems like I’m on constant “look out” monitoring this ego-maniac who calls himself The Sky Surfer to see what he’ll do next. It’s hard to keep up with him some times! I have no doubt he’ll cook up something new in a week or so. It takes a certain amount of courage to admit you made an error of judgement and even more so to go ‘Public’. None of us like to admit to mistakes, but by being open I bet lot of fellow aviators will read your mishap and say ‘there for the grace of God go I’. However, many more will learn and by being honest and open I bet they will check their landing strips more closely ‘whenever they go a visiting…..’. I expect this came as shock because you realised you came close to a potential disaster, or at best a badly damaged aircraft. Also by writing about your incident, you will in future make sure you know the terrain (or at least be aware of) before you land! Bet you now add this experience to your pre-flight plans as routine. Thanks for the professional outlook. Mostly I was embarrassed at kludging up my buddy’s field and glad I didn’t screw up my prop. On the other hand it has made me think of the problem I could have had if the landing field had been mud like that. As it happened it was just a big mess. That looks like a mess, indeed. Still, a mess is not really a disaster. When I read the lead to your story I was thinking a crash, or maybe a ground loop or going upside down on landing. I was relieved to see that there was no damage to the airplane or to you. Another adventure that will make an even better story in years to come. I am still in awe every time I read that you’re flying the Quicksilver in 25 mph winds! It was a mess but really not that bad particularly when Tommy had all the tools I needed to clean it up. My ability to fly in the higher winds is as much a testimony to the Quicksilver design as to my pilotage. I want guys to know that I worked up to flying in those conditions over time, though. It is a case of knowing the capabilities of the machine and matching that with technique. I find it fun and challenging to fly in windy conditions but I “inched up” to doing it. I didn’t fly in those conditions at the start and I wouldn’t advise others to. Some guys never like to fly in that type of wind and I respect that.